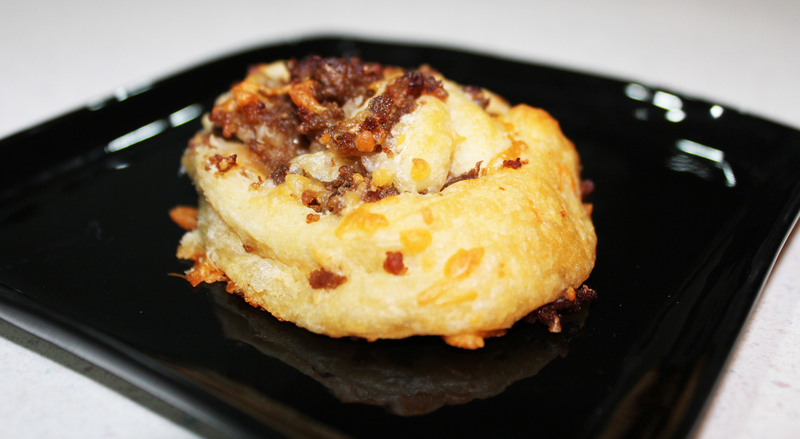 I needed to come up with a filling finger-type food for a gathering I was attending and decided Sausage Rolls would be fast and easy to make, but also be a filling and tasty addition to the food contributions. These come together quickly, require few ingredients and received Captain Cavedweller’s seal of approval. Brown sausage, drain grease, set aside. Roll out crescent dough, seal perforated edges and spread with cream cheese. I happened to have whipped in the fridge, but as long as it is spreadable you could use softened cream cheese from a block, too. Top cream cheese with sausage. Sorry… got involved in rolling this up and slicing before I realized I’d forgotten to take any photos. Place sliced rounds on a baking sheet and bake at 350 degrees for about 12 minutes. 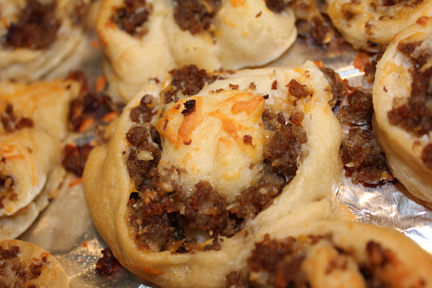 When the crescent roll turns golden brown and the cheese is melted, pull from the oven and serve. Brown the sausage and drain off grease. Set aside. Unroll the tube of crescent rolls, pinching the perforated edges together to form a long rectangle of dough. Spread cream cheese in a thin layer over the dough. 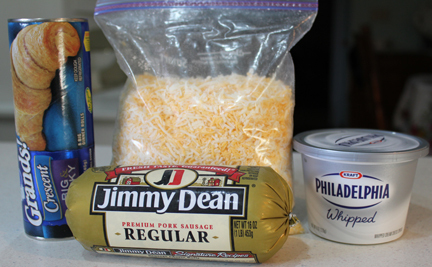 Spoon sausage on top then sprinkle with cheese. 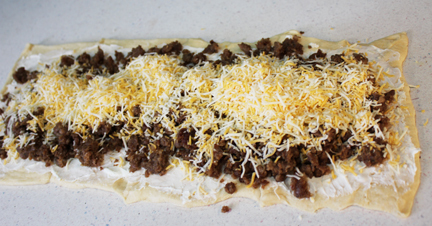 Starting on one long side of the rectangle, start rolling up the dough and filling. I forced Captain Cavedweller to help me because I couldn’t quite keep everything rolling forward like it should without an extra hand. Once you have a nice, tight roll, slice off rounds about 1/2 inch thick and place on baking sheet. 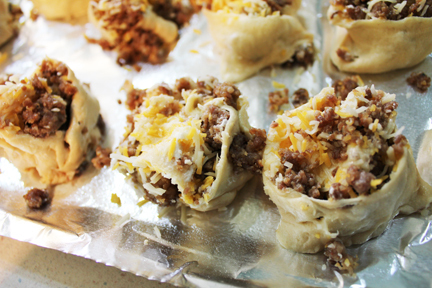 Bake about 12-15 minutes or until crescents begin to brown and cheese has melted. Remove from oven and savor the yumminess! You can serve with barbecue sauce or ranch dressing if you want a little extra burst of flavor.